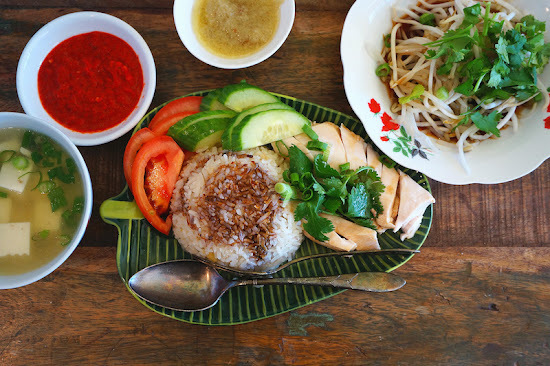 This Hainanese Chicken Rice is super delicious. The whole chicken is submerged in boiling water, cook briefly, and then sit in the water with the heat switch-off. This technique produces a succulent and tasty chicken. To complete the meal, serve with steamed rice cooked with the Hainanese chicken rice paste, some cucumber and tomato slices. Some good accompaniments for the chicken rice are ginger and garlic paste, fresh chili sauce, dark caramel soy sauce, aromatic soy sauce, blanched bean sprouts, and tofu soup. Poached Chicken: Place enough water in a large soup pot and bring it to a rolling boil. Put in the chicken, ginger, and scallions. Bring it to a boil again for 10 minutes. Turn off the heat, and let the chicken steep, about 45 minutes. Remove the chicken and put it in ice cold water for 15 to 20 minutes. Then drain well before serving. Rice: Heat the wok over medium heat, add the chicken rice paste and pandan leaf. Stir and cook for about 2 minutes. Then add the drained rice, and stir and cook until all the rice are coated with the paste. Transfer the rice into a rice cooker. Add chicken stock and season with sea salt. Cook as per manufacturer’s instruction. Fluff the rice before serving. Aromatic Soy Sauce: Combine all the ingredients and mix well. Tofu Soup: Bring the chicken stock to a boil, add cubed tofu. Simmer for 2 to 3 minutes, and season with salt and pepper. Top with some chopped scallions before serving. Blanched Bean Sprouts: Place blanch bean sprouts on a plate and mix with 1 1/2 Tbsp of Aromatic Soy Sauce. Top with coriander, scallions, and crispy shallots. To Serve: Chop the chicken into bite-size pieces. Place the steamed rice on a plate, chop chicken, cucumber slices, tomatoes, some aromatic soy sauce on the chicken, drizzle with dark caramel soy sauce on the rice, optional. Serve with tofu soup, blanched bean sprouts, ginger and garlic paste, and child sauce.